"We are not one size fits all." Diba nga naman, kahit sa facial care, hindi uubra ang isang soap lang since even skin types differ for every person. In my case, I have a really really weird skin regimen na magugulat ang mga derma pag narinig nila (haha)...Kaya I was excited (kahit delubyo ang weather) as I headed to SM Makati to finally learn more on facial care lalo na sa skin type ko. I love this section in the event area: Free Skin Check! 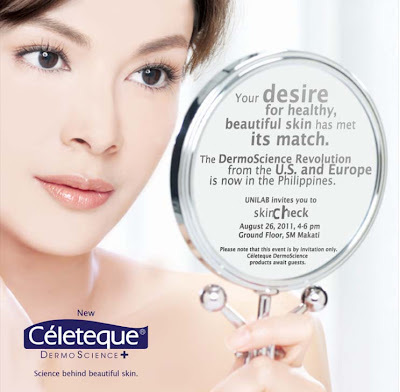 "UNILAB brings you DermoScience: The science-based solution to give you healthy, beautiful skin!" UNILAB introduces CELETEQUE DermoScience: A fusion of new active ingredients, technologies, and dermatologist-developed solutions for specific beauty concerns. Each product is co-developed with top dermatologists and clinically-tested to deliver results! 1) Hydration - Gently restores the skin's healthy suppleness with moisturizers and vitamins that nourish the skin without the greasy after-feel. 2) Brightening - Expertly targets melanin concentrations and evens out skin tone with carefully selected active lighteners that uncover a luminescent glow with harmful side effects. 3) Sun Care - Adequately provides daily protection from UVA and UVB rays with broad spectrum coverage and moisturizing agents to help prolong the skin's youthfulness amidst a polluted external environment. 4) Acne Solutions - Effectively controls excess sebum and clarifies unsightly acne by removing build-up of dead skin cells and combating pimple-causing bacteria for smooth, blemish-free skin. 5) Advanced Anti-Aging - Intelligently erases fine lines and wrinkles by stimulating collagen production with breakthrough peptide and anti-oxidant ingredients for beautifully restored skin elasticity, softness, and smoothness. 6) Restorative - Intensively lifts and firms loose and sagging skin and lessens the depth of adult wrinkles with more potent peptides and antioxidants that result into skin that's younger than one's age. They recommend that I use the Celeteque Sun Care line especially as a commuter, I am always exposed sa arawan at polusyon! And of course, Hydration para kutis bata padin! Haha! Our loot bag...na literal na bag! :) I love it! <3 New white bag for meee! Told dra about my current facial regimen: I use Dr. Kauffman for my face! (seryoso) I read this in some forums, na ok daw pag mapimple/oily skin...So I gave it a try and have been using this soap for years na. But I learned from the derma that harmful to sa skin in the long run...Dahil sobrang drying siya and the soap is really meant for extreme skin conditions. Akk! Took home a variety of Celeteque DermoScience products...Watchout for a future giveaway! :) Thank you so much Celeteque and UNILAB! This will be my new nightly routine: cleanse, tone, and moisturize! 2) Tweet: "Join @anagon 's Celeteque giveaway ! http://anagonsblog.blogspot.com/2011/08/celeteque-dermoscience-revolution.html"
3) Post your name, email address, and link of your tweet in the comment box below! 4) Follow Unilab's FB and Twitter! Hi Sis, joined your contest. Ay bet ko to!! :) Celeteque user din ako. :"> Join ako, Ms. Ana. Followed Unilab in Twitter and Facebook, too! pasali din, i love celeteque! Thank you for this give away,my friend recommended this to me last sunday but I just don't know where to purchase such. Hello there Ana. Just joined your contest. :) I love Celeteque too. Hi Ana.. ganado ko magcomment.. syempre join ako dito..